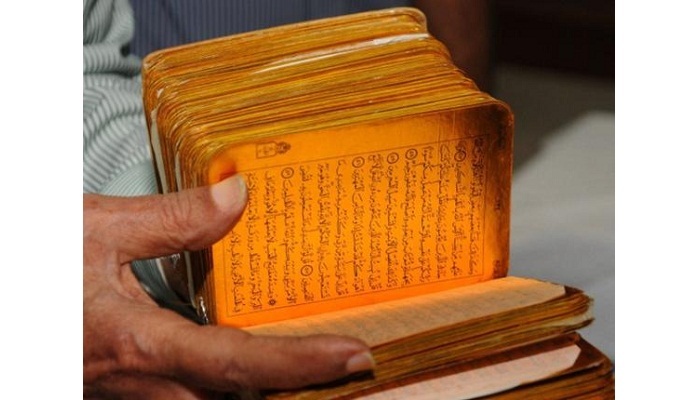 JNN 22 Aug 2015 Delhi : 410-year-old copy of the Holy Quran dating back to Mughal ruler Jalaluddin Muhammad Akbar’s period has been recovered by the Indian police in the Mysuru district. The paper quoted Mysuru District Superintendent of Police Abhinav Khare as saying that a gang of 10 members who had bought the copy from ‘unidentified’ persons in Hyderabad, were trying to sell it for a price of five crore Indian rupees (approximately $776,754), Daily Times reported. “When we learnt about them trying to sell the valuable Islamic book by sharing videos, a team of policemen approached them in KR Nagar posing as prospective buyers,” he said. Historian B Sheikh Ali described the calligraphy in the book as a piece of art. The copy contains 604 pages. The last page bears the year in which it had been written. “It was written in 1605AD, which is around the period when Mughal rule was its peak in the Indian subcontinent and the time when Jalaluddin Muhammad Akbar was succeeded by Nur-ud-din Mohammad Salim (Jehangir),” he said. “There is no information except that it is dedicated to the saints of that period,” Prof Ali said. “Though I have seen many copies of the Quran in India, I have not seen one as old as this,” the paper quoted him as saying. This entry was posted in Asia Pacific and tagged Abhinav Khare, Holy Quran, india, Indian subcontinent, Jalaluddin Muhammad Akbar, mughal Era, Mughal rule, Mysuru District Superintendent of Police, Sheikh Ali. Bookmark the permalink.